Hexagon, the well-known north London-based business, which has for many years been one of the largest and most established BMW dealerships in the UK, has decided to step back from new car sales to focus entirely on classic car sales with the opening of a new, purpose-built showroom in North London. Hexagon Classics has built an international reputation for the sale of high-end classic cars, specialising in quality examples of Aston Martin, Ferrari, Porsche and Jaguar models sold out of its exclusive Kensington Mews premises in Central London. 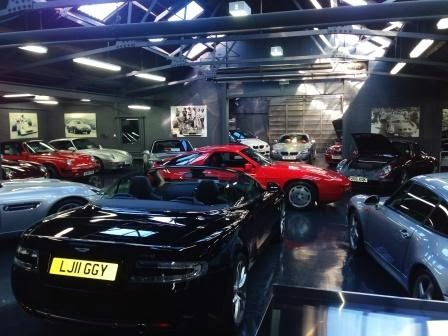 More recently, Hexagon has launched a new venture, Hexagon Modern Classics, which specialises in the best sub-£100,000 BMW and Porsche cars available to the market and which has now moved to an all-new, dedicated premises at 90 Fortis Green, in North London. Hexagon Modern Classics is dedicated to dealing in exceptional examples of modern era cars which present enthusiasts with an affordable entry to classic car ownership, and with cars that represent genuine future investment potential. With the restructuring of the business, Hexagon Modern Classics will complement the existing Hexagon Classics business by focusing its considerable expertise on classic models manufactured from the 1970’s through to recent, limited edition, specialist models. Hexagon Modern Classics has a particular specialisation in all air-cooled Porsches up to and including the 993 series cars and M-series BMWs ranging from the E30 through to E46 and M5 derivatives. A new premises close to Hexagon’s established East Finchley site, has recently been entirely refurbished and will be the new home of Modern Classics. Hexagon also has a long racing history with cars such as D-Type Jaguars and Formula 5000. In 1972 Hexagon Racing ventured into Formula One with driver John Watson, and various sports car series with drivers such as Richard Atwood, Bob Evans, Derek Bell, Brian Henton, Carlos Pace and Gerry Marshall.